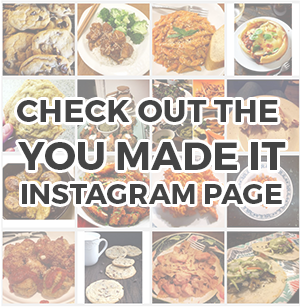 If every meal could be this easy, I’d be a woman with a whole heck of a lot of free time on my hands. Or maybe I’d actually get all of my chores and errands done. Or maybe I’d waste even more time answering those internet quizzes that will guess my age based off of my favorite sandwich toppings. Yeah, probably that last one. 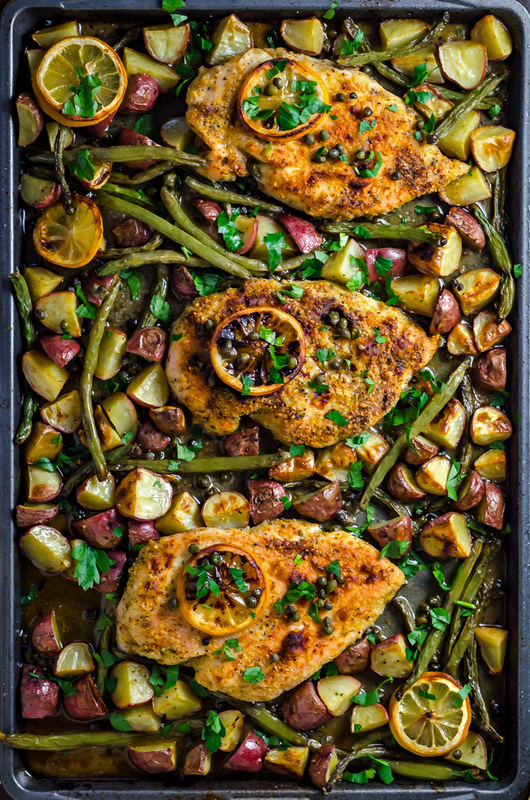 But the point is that this Sheet Pan Chicken Piccata with Roasted Potatoes and Green Beans makes bringing a full meal to the dinner table super simple and makes clean-up a breeze. And did I mention that it tastes amazing? Because guys… GUYS. 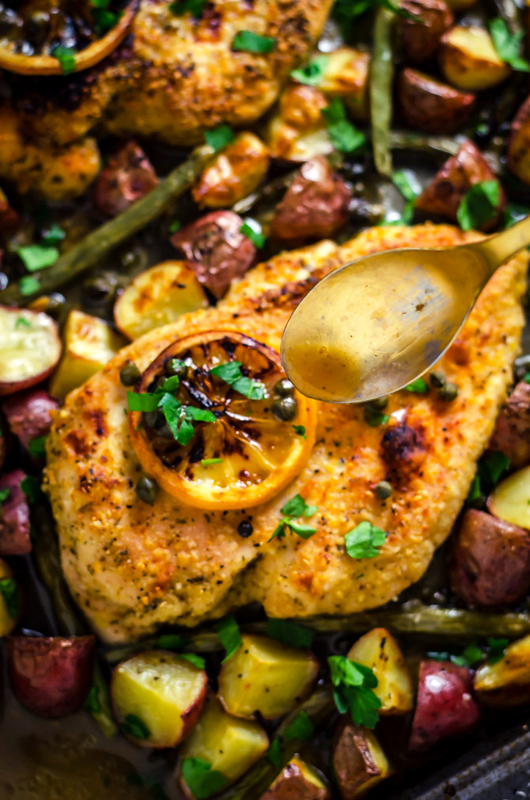 That lemony, buttery, savory sauce is absorbed into the chicken, potatoes, and beans, and it is a thing of dreams, I tell ya. 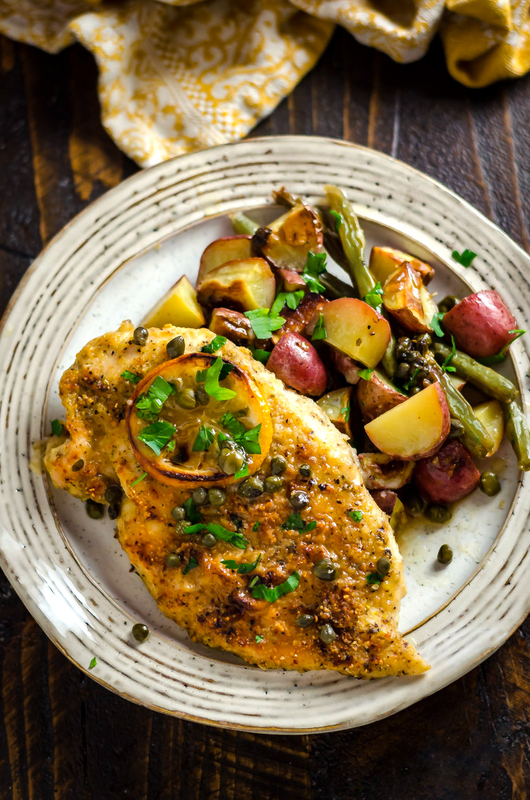 If you’ve ever had chicken piccata before, you’ve probably had a pan-fried version, which is delicious as-is. But baking the chicken AND sides all together in the lemon-based sauce really ramps up the flavor without requiring a ton of pots and pans. Now that I’ve made it this way, I don’t think I’ll ever go back. By the way, after baking everything in the lemon sauce, spoon some more over the chicken. You’re going to want as much of it as you can get. 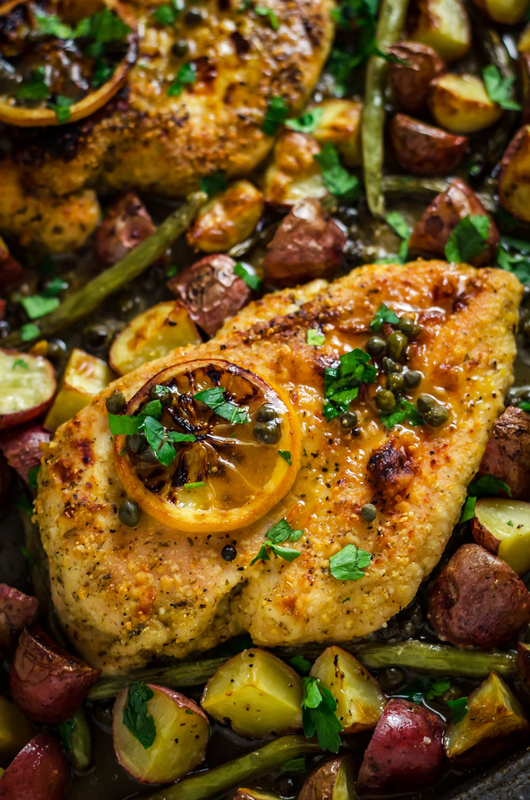 I’ve taken a few other liberties with this recipe that deviate from the traditional chicken piccata, like the fact that I’ve chosen to leave out the wine. Personally, I feel that it’s not necessary to open a bottle of wine just to flavor the sauce that already gets so much tang from the lemon, and this way you get a more accessible weeknight recipe. However, if you want to crack open the vino and pour some in, be my guest. It’s a good date-night option, if you feel so inclined. And while I didn’t make this recipe for an actual date night, I have to say that my forever-date (ew that was corny) was in love with this dish. You know you did good when your boyfriend comes home from work and immediately asks if there are leftovers from last night’s dinner because he’s been craving it all day. 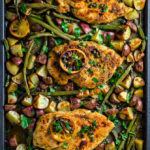 We only had one serving leftover, so I let him have the chicken while I staked my claim on the roasted potatoes and green beans– and they were just as good the second day as they were the first. Next time, I might have to make a double tray. 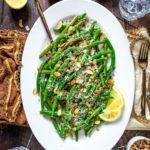 This is one of those recipes that’s a surefire hit with your whole family– and you can even switch up the veggies for your pickier eaters if you prefer. Or on the other hand, you could even sneak in some broccoli (because it would be great with the lemon and capers!) and get your kids to gulp down some extra greens. Come to think of it, I’m going to have to try this with broccoli next time. Season the chicken with kosher salt and black pepper and set aside. In a large, sealable plastic bag, combine the flour, parmesan cheese, paprika, Italian seasonings, and garlic powder. Shake well to evenly distribute. Add the chicken to the bag, seal, and shake to coat evenly. Place the stick of butter on a large, rimmed baking sheet and place in the oven for a few minutes, until just melted and deep golden, but not browned. Carefully remove the baking sheet from the oven and mix the chicken stock and the lemon juice into the melted butter. 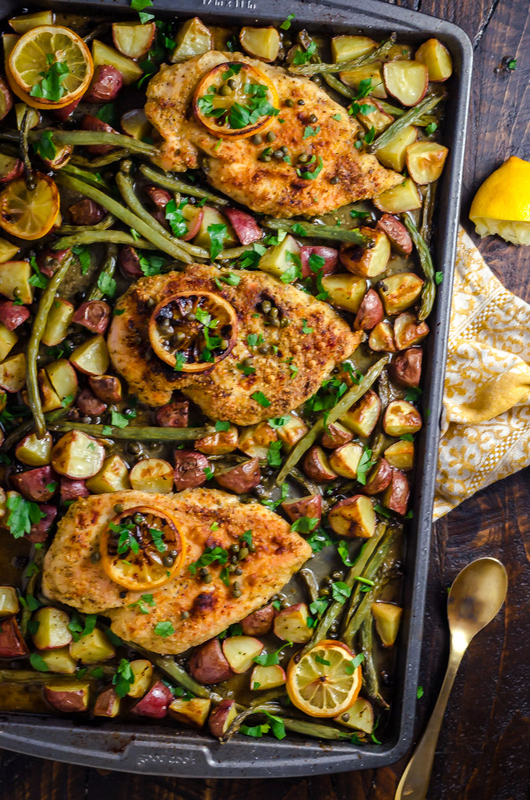 Place the flour-seasoned chicken breasts down the center of the baking sheet and surround by the potatoes and green beans. 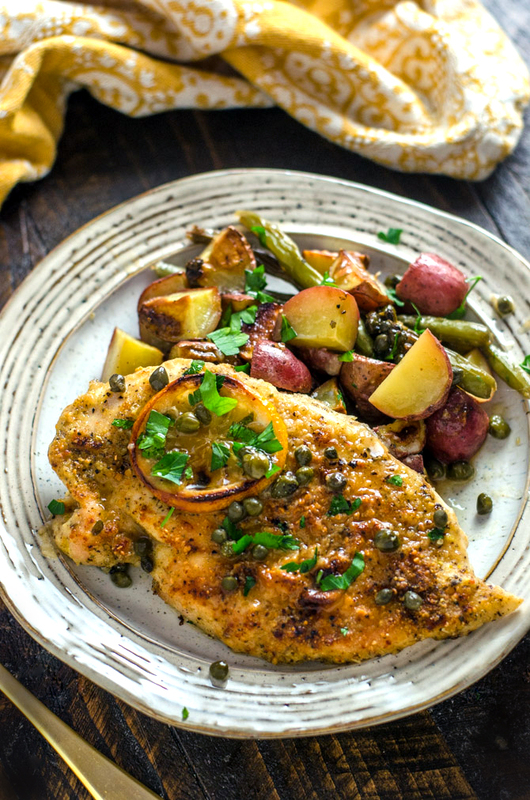 Sprinkle the capers evenly over the pan, and top the chicken and vegetables with the lemon slices. Spoon some of the melted butter mixture over the vegetables and season them with salt and pepper. 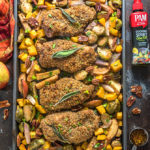 Place the baking sheet back in the oven and bake until chicken is cooked through and potatoes are tender, about 25-30 minutes. If the pan is beginning to dry up, add additional chicken stock and lemon juice. 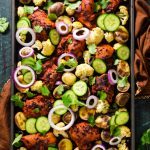 Set the oven to broil to crisp the tops of the vegetables and chicken and broil until lightly browned. Spoon the sauce over the chicken and top with chopped parsley. Serve warm. Soooooo good! I got lucky when I went to the grocery and they had thin cut chicken breasts so I didn’t have to pound them out (busy evening). So very very good and glad I cooked extra so the hubs and I have a super yummy lunch for work tomorrow. Thanks for such an AWESOME dinner Morgan!! 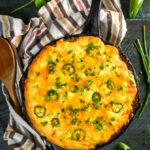 Really enjoyed this recipe! I added broccoli and mushrooms to the pan too. Yum! This was so delicious and so easy! I forgot to pound the chicken beforehand so I just covered it with foil and cooked it longer. Came out just fine! This would be really good with some little cherry tomatoes added just before broiling too. I used asparagus since that’s the veg I had on hand. This was a tasty meal with easy clean up.